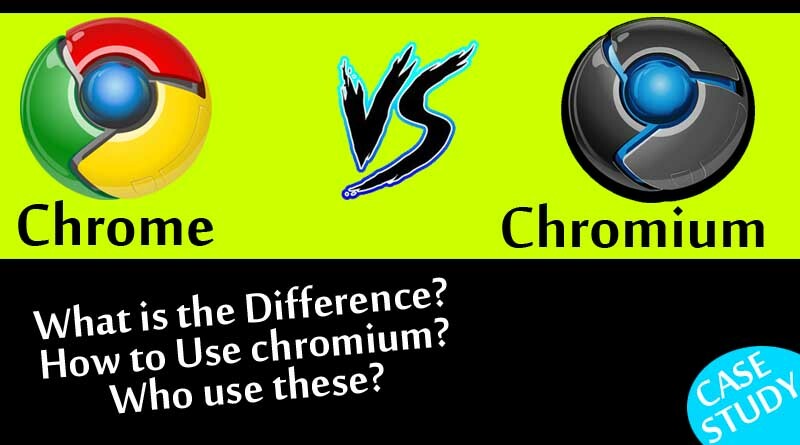 Chromium vs Chrome Browser, Which one is Better? Home » LATEST » Chromium vs Chrome Browser, Which one is Better? Google Chrome, yet another powerful product from Google. As we all know Google Chrome browser is one of the most popular and high rated internet browser in the world. User friendly interface and lot of add-on and plugins makes it easy to use and hence it’s quite popular among amateur to professional users. Chrome browser was introduced in 2008 by Google. Recently Google launched an open source browser for user and this left all the users astonished about the difference between the Chrome and Chromium browser. Here we are gong to take a brief knowledge of the Chrome and Chromium browser. But before we start, let us talk about these two browser separately. Here is the list of extras add-on and features, Google adds to Chromium to make it Chrome. Introduced in years 2008, Chrome is one of the popular and fastest browser in the world. Chrome is However based on Chromium but operated and governed by Google. There are lots of feature in Chrome which makes it popular and user friendly. Auto update, Developer mode, Extensions etc. are some add-on feature of Goggle chrome which makes user experience rich and easier. Google Chrome is a end user free to use browser but on the other hand, Chromium is a open-source browser project which was designed to to form the basic for Chrome browser. Chromium was however introduced on 2008 as well. In order to develop Google Chrome they used the code which was open-sourced and was later released as Chromium. In short, Chrome is a browser and Chromium is open source code which was used to develop the Google Chrome Browser. This open-source code is maintained by Chromium Project, While Google itself maintains the Chrome Browser. Chrome itself is based on Chromium but in order to make Chrome advance and more user friendly, Google have implement some certain and advanced closed-sourced codes to make Chrome more stable and add some extra feature which Chromium lack. In other words Google uses the open-sourced codes from Chromium to develop Chrome and the they put some extras codes to make it better. AAC, H.264, and MP3 Support. Chrome includes licensed codecs for these proprietary media formats, giving you acess to a wider variety of media content—particularly sites using HTML5 video to stream H.264 videos. Both browsers include the basic, free codecs: Opus, Theora, Vorbis, VP8, VP9, and WAV. Google Update. Windows and Mac users of Chrome get an extra background app that automatically keeps Chrome up-to-date. Linux users use their standard software management tools. Security Sandbox (?). Google also notes that some Linux distributions may disable Chromium’s security sandbox, so you’ll want to navigate to about:sandbox in Chromium to ensure the sandbox is enabled and functioning by default. This is one of Chromium (and Chrome’s) best features. Extension Restrictions. For Chrome, Google disables extensions that are not hosted in the Chrome Web Store. Crash and Error Reporting. User of Chrome can opt to send statistics on crashes and errors to Google for analysis. I know after reading all the above explanation and examples, you are still not convinced. There are still some questions yet to be answered. Like, how to use chromium, what is the use of Chromium and where to download Chromium? etc. Scroll down and I bet you will completely satisfied and hopefully get almost all the answers for your question. Chromium is a complete browser itself. Yet there are handful of people who prefer to use Chromium over Chrome or Firefox. People usually use Chromium open source code to make their own customized browser and re launch it with a different name. Below is the list of all web browser which are built on chromium open source codes or are based on Chromium. If you are a developer and love to play with codes and arrays. You may Download Chromium here and try your hands on the codes. Conclusion:Chrome is a browser and Chromium is open source code which was used to develop the Google Chrome Browser. This open-source code is maintained by Chromium Project, While Google itself maintains the Chrome Browser. For more How-to guide Windows tweaks and latest Smartphone update please subscribe to our news letter by providing you Email-ID. Also feel free to discuss in comment section below.